Raleigh Mayor Charles Meeker wants to hear from community leaders about important policy decisions the Wake County Board of Education is making. Before meeting with the Mayor, let’s talk! * What are community members thinking, feeling, and wanting? * What should be our strategy for the meeting with the Mayor and is there a unified message we want to convey? Free pizza, drinks, and childcare will be provided. The East CAC is in the news again as Raleigh Mayor Charles Meeker seeks experts to challenge the Wake County School Board’s proposed school assignments. With an eye toward a potential lawsuit, Raleigh Mayor Charles Meeker is recruiting Raleigh community leaders and legal experts to scrutinize how students get assigned to schools now that the Wake County school board has eliminated assignments based on socioeconomic diversity. Meeker, who is married to Wake school board member Anne McLaurin, said legal action could follow, if it appears that the school board’s yet-to-be-released student assignment plan violates the state constitutional rights to a sound education. Meeker told members of the East Raleigh Citizens Advisory Committee on Monday that he’s trying to enlist experts to see if the school board’s new student assignment plan violates state constitutional law. The new board hopes to approve by the end of next year a new plan that would divide Wake into different zones with students going to schools in their community. via Raleigh mayor seeks experts, leaders to analyze school board – Education – NewsObserver.com. WakeMed visited Monday’s East CAC meeting and came away impressed. WakeMed is Wake County’s largest private employer and is located in East Raleigh. Yesterday evening, I had the distinct pleasure of attending the East Community Advisory Council (CAC) meeting at Lions Park Community Center off Dennis Drive in Raleigh. At WakeMed, we are more committed than ever to being involved with the communities we serve and want to understand community issues from citizens’ perspectives so we can be even better neighbors. This commitment led me to the East CAC meeting to represent our WakeMed Raleigh Campus, which is located in the district. One thing that Ms. Monackey didn’t mention is that Raleigh’s CACs are chaired and organized solely by community volunteers. via Do you know your CAC? | WakeMed Voices. Ray Martin of the News and Observer mentioned the upcoming Capital Boulevard Corridor study in yesterday’s Midtown Raleigh News. Want to help spruce up Capital Boulevard? If so, the city wants to hear from you at a workshop scheduled for 6:30 p.m. June 24. It’s the official kick-off for a wide-ranging study on how to transform the Capital Boulevard corridor between downtown and the Beltline into an attractive gateway to the Capital City. Changes are likely to include street improvements, new businesses, upgrades of impaired Pigeon House Creek and additional housing. If you plan to attend this important meeting next week (and as an East Raleigh resident you should! ), please be sure to preregister with the city planning department so they will know how many to expect. The East CAC will meet on Monday, June 21st at 7 PM at Lions Park Community Center, 516 Dennis Avenue. This month, our special guest is Raleigh Mayor Charles Meeker, who will be discussing his vision for East Raleigh in light of the New Bern Avenue and Capital Boulevard studies now taking place. We’ll also hear from our new Raleigh Police Southeast District commander Captain Andy Lull. And we’ll also have representatives from the city’s Inspections department present to answer questions. As usual, this meeting will be streamed on the Internet for those who cannot make it in person. Watch this space for details. It should be an informative meeting. Please invite your friends and I hope to see you next Monday, the 21st! The grand opening for the Lions Park Playground will take place Monday, June 14th at 1 PM. 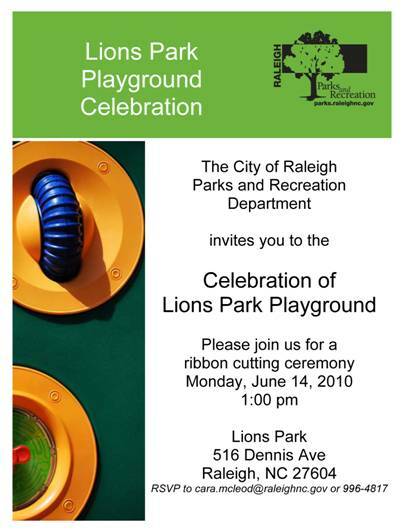 The City of Raleigh Parks and Recreation Department invites you to the Celebration of Lions Park Playground. Please join us for a ribbon cutting ceremony Monday, June 14th, 2010 at 1 PM.